South Carolina Police Officer Charged With Murder After Shooting Man In Back : The Two-Way Officer Michael Slager previously said he had followed procedure, but a video showed him shooting a man who was running away from him after a traffic stop. A white police officer who shot and killed a black man after a traffic stop was charged with murder in North Charleston, S.C., on Tuesday. 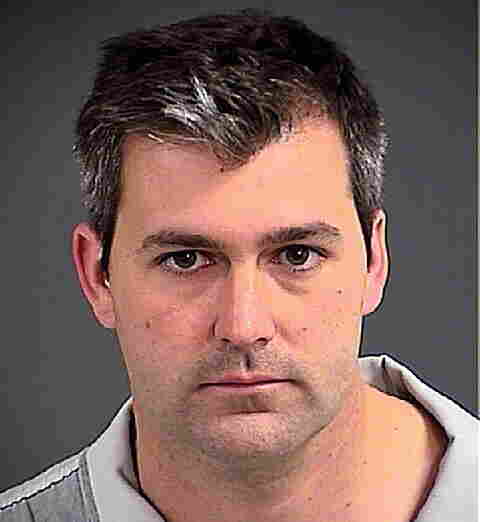 The Post and Courier, a newspaper in Charleston, reports that officials said a video, which shows officer Michael Slager, 33, firing at 50-year-old Walter Scott as he fled, played a role in the decision. "Mayor Keith Summey added during a news conference that Slager's 'bad decision' prompted his arrest. "The footage, filmed by an anonymous bystander, shows the end of the confrontation between the two on Saturday after Scott, who had a warrant out for his arrest, ran from a traffic stop. It was the first piece of evidence that could contradict a statement that Slager released to the public through his attorney." According to WCIV-TV in Charleston, Slager had said through his attorney that he believed he followed protocol during the incident. "The shooting happened about 9:30 a.m. [Saturday] when Slager told investigators he pulled over Walter Scott for a broken tail light at the corner of Remount and Craig roads," WCIV-TV reports. "According to an incident report, officers [heard] Slager say over the radio that he had deployed his Taser and 'seconds later' he said 'Shots fired and the subject is down. He took my Taser.'" The video shows that Slager shot eight rounds without a verbal warning and even as Scott continued to run away. The video also shows that in the aftermath, Slager puts handcuffs on Scott. Officer-involved deaths have, of course, become national news lately, because of two high-profile cases: In Missouri, a police officer shot and killed 18-year-old Michael Brown. And in New York, a police officer used a prohibited chokehold against Eric Garner, which contributed to his death. In both cases, grand juries declined to issue charges against the police officers. The shooting deaths have ignited a debate over whether police officers have been too quick to use force. The Post and Courier reports that at the time of his traffic stop, Scott had an outstanding Family Court warrant for his arrest. Scott, the paper reports, "had a history of arrests related to contempt of court charges for failing to pay child support. The only accusation of violence against Scott during his lifetime came through a 1987 assault and battery charge, but the disposition of that charge was not immediately known." Reuters reports that the FBI and the Justice Department have launched an investigation into the shooting. "The federal probe will be handled by the U.S. Justice Department's Civil Rights Division and the South Carolina U.S. Attorney's Office together with the Federal Bureau of Investigation," Reuters reports. An earlier version of this post said Eric Garner was shot by police in New York. He died partly as a result of a prohibited choke hold.